With Geometry Expressions, you can draw a diagram and get code generated directly in any one of a dozen different languages. Cut and paste the code and avoid transcription errors! You have code to draw a segment, but you want to allow the user to bow the segment out by a specific amount to turn the straight segment into an arced segment. We see how to get a code snippet for a single scalar value. 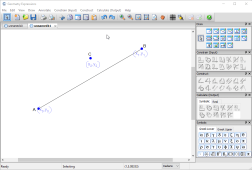 What is a nice formula for the perpendicular distance between a line segment and a point? We see how to get code as a function. 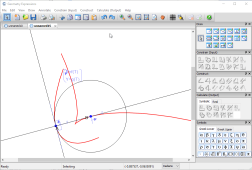 Geometry Expressions can generate code for the coordinates of a point. 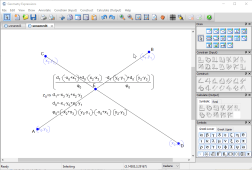 In this example, we create C++ code for the intersection point between two line segments. 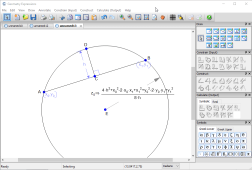 You want to display the circle of curvature of a user defined curve. We see how to use the generic functions in Geometry Expressions to create such code with placeholder code for the functions themselves.